"Sampath Speaking" - the thoughts of an Insurer from Thiruvallikkeni: cake cutting ~ draw parallels - do not cut the wedges ! cake cutting ~ draw parallels - do not cut the wedges ! There are some things associated with happiness and celebration - cakes and fruits (though there are many like me who do not celebrate birthdays – more so never indulge in cutting cakes and et al.) – strawberry is crowed to be ‘happiest fruit’ – a survey for University of London states that its appeal is so strong that 86% (of whom they surveyed) feel more relaxed just by thinking about eating one. The birthday cake has been an integral part of the birthday celebrations in western European countries since the middle of the 19th century, and in many ways we ape Western culture. Sadly, sometimes States are created like ‘cutting cakes’ …. Be it Cake or any other asset, a fair-share is fundamental necessity and that would take us to the famous story of Tenali Rama, a gem in the durbar of Krishnadeva Raya. A wealthy man willed that his 17 elephants should be divided among his three sons in such a way that the first son got half of the total number, the second one-third, and, the third, one-ninth. The king asked Tenali Rama to effect the division because nothing seemed to satisfy the three sons, 17 being a prime-number. Elementary, as Tenali Raman brought his elephant to the venue where the division was to be made, taking the total number of elephants to 18. Then he divided the number into half (9), one-third (6) and one-ninth (2). The total was thus 17, divided to the satisfaction of all concerned. The out-of-box thinker Tenali Rama rode back home on his elephant with pride and pleasure. Fair division is a mathematical theory based on an idealization of a real life problem. The real life problem is the one of dividing goods or resources fairly between people, who have an entitlement to them. The central tenet of fair division is that such a division should be performed by the players themselves, maybe using a mediator but certainly not an arbiter as only the players really know how they value the goods. A proportional or simple fair division guarantees each player gets his fair share. When there are 4 people lined up, cutting cake in to two halves and further into two more would give 4 of equal size for all. Apart from proportional sharing, an envy-free division would guarantee that none has somebody else's share more than their own. An exact division is one where every person thinks everyone received exactly their fair share, no more and no less. So allocation and sharing of resources – not necessarily in equal proportion but in fair proportion has been the basis of many disputes including the river water sharing be it Kaveri or any other water. The famous Polish school of mathematicians (Steinhaus, Banach, and Knaster) introduced and described algorithms for the fair division problem in the 1940s, the concept has been widely popularized. There are many different kinds of fair division problems, depending on the nature of goods to divide, the criteria for fairness, the nature of the players and their preferences, and other criteria for evaluating the quality of the division. 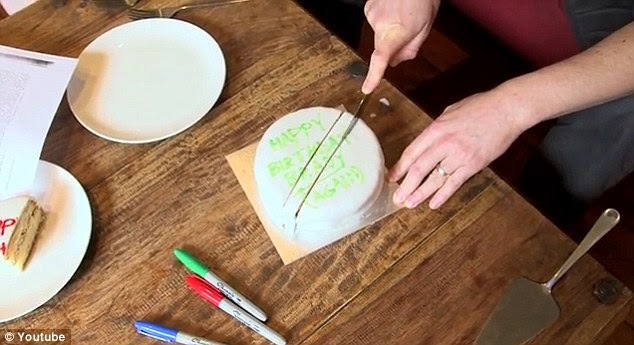 According to Bellos, if a wedge is taken out of a cake but the rest of the food is then stored in the fridge, the edges of the cake open to the air will be ‘dry and horrible’. The better method published in Nature in December 1906 in the letters to the editor section by English mathematical scientist Francis Galton titled ‘Cutting a round cake on scientific principles’, explains how the ‘ordinary method of cutting out a wedge is very faulty’. It says that cake should be cut in parallel lines, starting in the centre, with the rectangular segments of the cake then taken out and eaten. This would allow the cake to then be closed, provided it is one with icing, keep the sponge inside sealed and retaining its freshness. 'The direction of the first two vertical planes of section is unimportant; they may be parallel, as in the first figure, or they may enclose a wedge. No need for science formulas when you find the cake in centretable vanishing within minutes of it being cut – and none who got a share complains !